Frank Lovell was born on April 1st, 1917, in Boston, Massachusetts and was raised in Houghs Neck, Quincy, MA. His mother was an Irish immigrant and his father was American and worked as a chauffeur/auto mechanic for wealthy people. His specialty was Rolls Royce cars. Frank grew up playing baseball for the local youth league. After graduating from High School he went around the country trying out for major leagues – He ended up playing Minor league baseball for Utica, New York. He was one of the first men drafted in Quincy, MA, in 1940. On his draft card his occupation was listed as clam digger. During the Depression he supported himself, as did his brother, by digging then selling clams. Initially he was at Fort Bragg in Battery “A” of the 9th Infantry Division, Field Artillery Battalion. 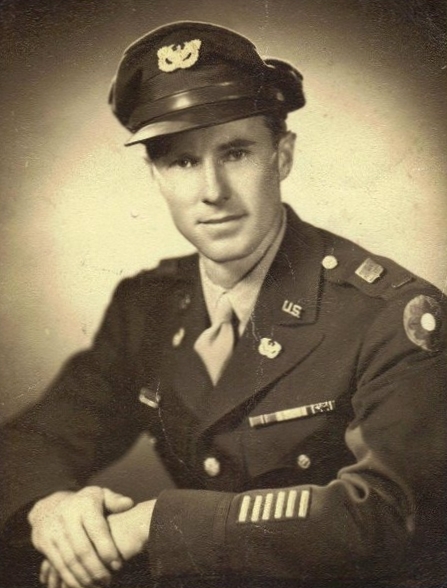 Later he became a clerk and transferred to the Headquarters (HQ) Section of the 60th Field Artillery Battalion, 9th Infantry Division. By completion of his service he was a Chief Warrant Officer. Just as he was anticipating being let out of the army the Pearl Harbor attack happened. He ended up serving a total of 5 years in the army. Prior to landing in Normandy Frank participated in all the 9th Division campaigns. This included the invasion of Morocco as well as action in Algeria and Tunisia. This was followed by the invasion of Sicily. Prior to Normandy his unit rested at Camp Barton Stacy in England. Frank then fought in France, Belgium and Germany. 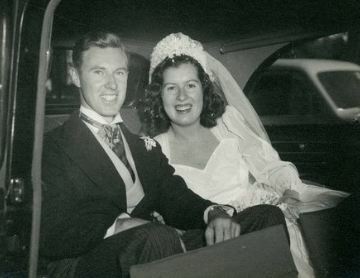 In 1945 he met his future wife, Patricia Anna Donnellan, who he married in 1946. After living in Brighton, MA they moved to West Roxbury, MA. They had 5 children. After the war Frank worked for 30 years in the U.S. Post Office as a clerk. Frank Lovell kept a diary during his whole service time, and took over 500 photographs. Mary, one of his daughters, is in the process of gathering the information and will publish the diary in the future. 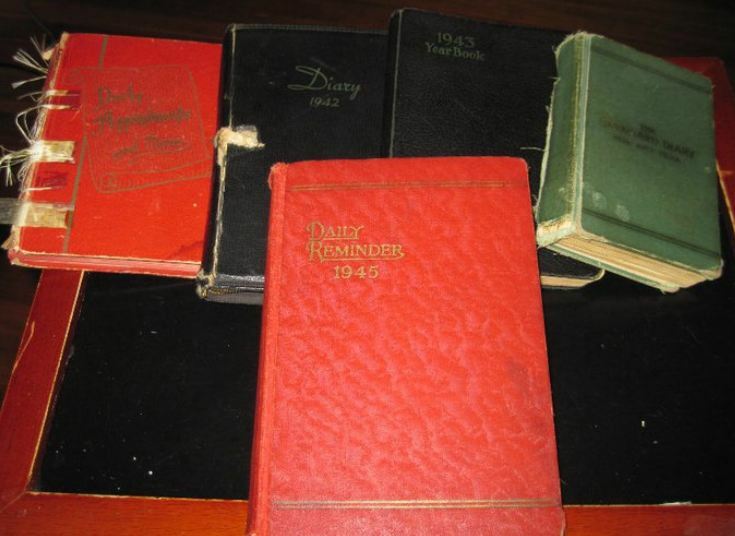 With some gripping diary entries and impressive photographs, we can learn more about the daily life of the men serving in the Field Artillery Battalions. This will surely be a unique historical document for many. 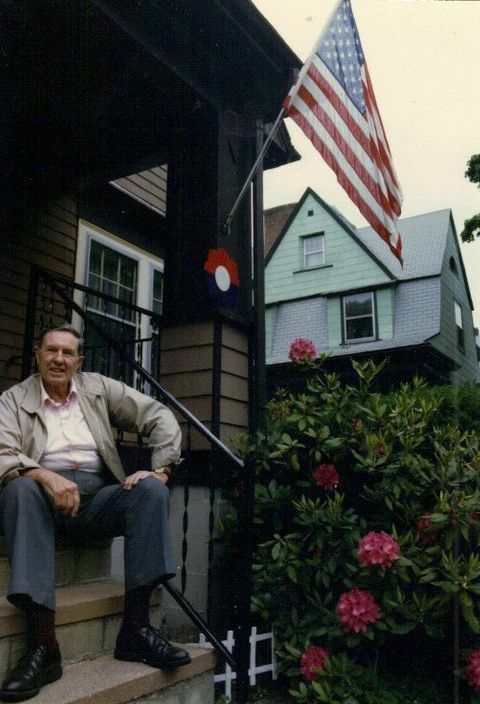 Frank Lovell in later years in front of his house. Note the Octofoil! Frank Lovell passed away on January 25th, 1996. Last year, in May 2011, I met up in Germany with Frank’s daughter Mary. We met in the town of Monschau, a small resort town in the Eifel region. Frank visited this town as well during the war, and took several pictures. Mary and I were able to retrace the spots where the pictures were taken, and made some “then and now” pictures. 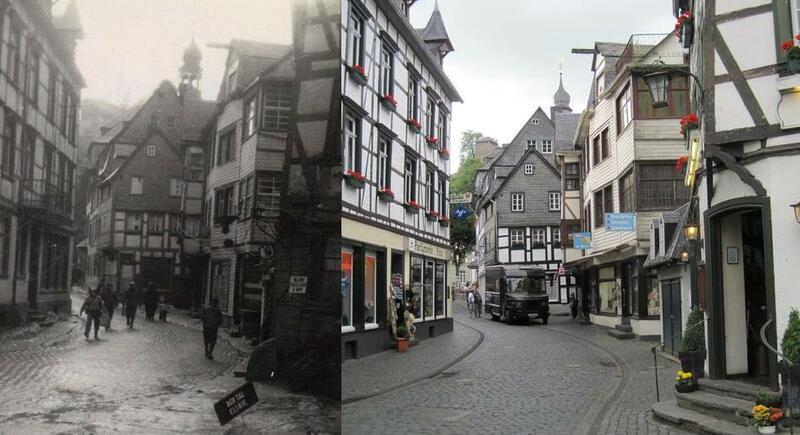 Monschau then and now. Frank Lovell took the picture on the left of George Newhardt and Harry Hammer standing in front of Hotel zum Stern in 1945. His daughter Mary and I stand at the same spot in 2011. 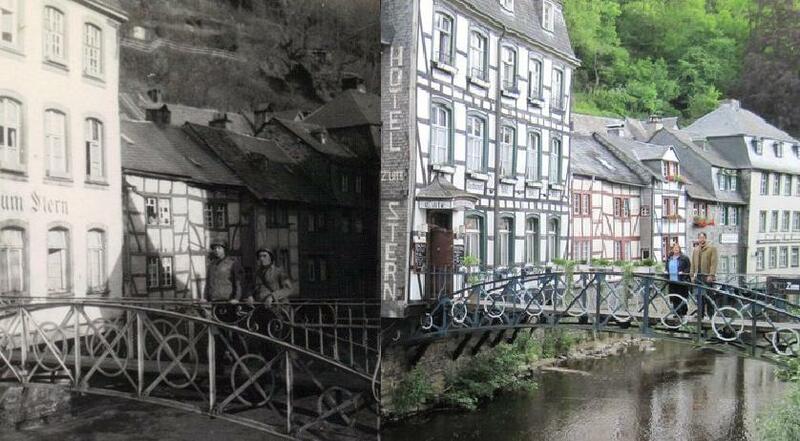 Monschau then and now: February 10th, 1945. We have found the same street in May 2011. Amazing how little has changed. During that day we visited several spots that are mentioned in Frank’s war diaries. We actually managed to find certain villages and places he has been to as well during the war. We visited the town of Sourbrodt and Camp Elsenborn, where they still have some nice 9th Infantry Division memorabilia. It was a very special day, and Frank has a very special place in my heart.